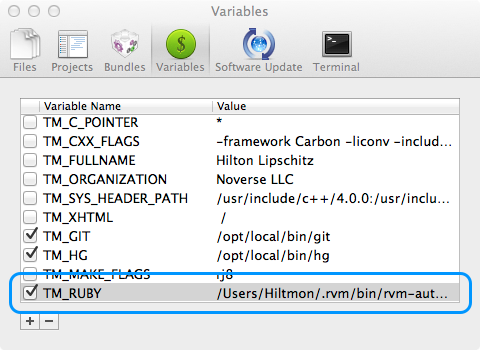 I use Ruby Version Manager (rvm) to manage the interpreters and gemsets for all of my projects. But the default install of TextMate 2 uses the system ruby interpreter for internal command execution as well as for external runs. Here is how to use your rvm environment for both. tl;dr: Set the TM_RUBY variable in preferences or your ~/.tm_properties file to the path returned by which rvm-auto-ruby and restart. That will set the internal runner. For external runs from within TextMate 2, also comment out the shebang in the script before pressing ⌘R (or run from the terminal directly). Sublime Text 2 users, check the end of this post for ⌘B use. … or in your ~/.tm_properties file. It now matches my rvm version. It seems to be using the system ruby. It is now using the correct rvm version. Don’t forget to uncomment the shebang line when you are finished. Note that this will probably get overwritten when the Ruby package gets updated. Note also that neither $HOME or ~ work here, you need the full path.